Humpback whales (Megaptera novaeangliae) were made famous by the discovery that male whales sing long complex songs on the breeding grounds. Humpbacks, however, also produce a wide range of sounds throughout their range—purrs, shrieks, whups, moans, and more—that have received considerably less attention[2-5]. Unlike song, which is produced exclusively by male whales and serves a presumptive breeding purpose, males, females, and juveniles all produce these ‘non-song vocalizations’ [3, 4, 6-10], although the context under which these sounds are used remains largely unknown. The ocean is getting louder. As shipping throughout the North Pacific, and the world, continues to increase humpback whales, and many other acoustically oriented marine animals, run the risk of being negatively impacted by an inundation of man-made (anthropogenic) noise. 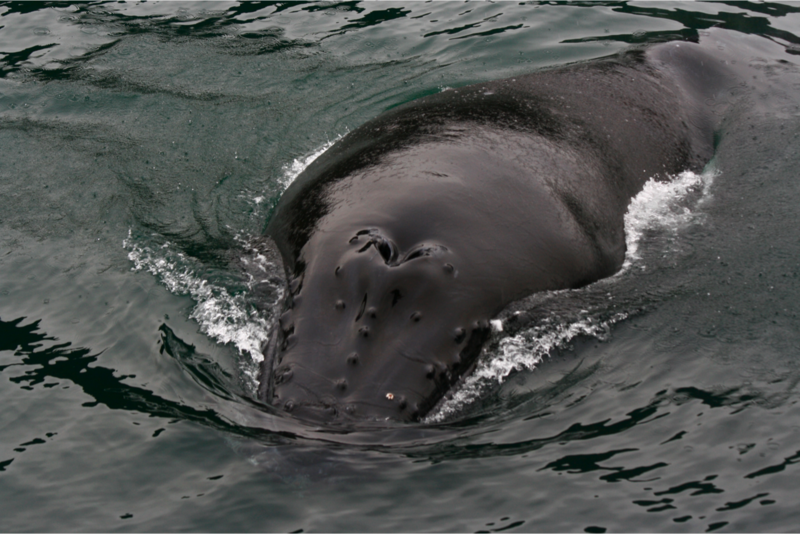 Large vessel noise from shipping in particular may have the ability to acoustically mask humpback whale vocalizations, preventing animals from being able to detect one another (Figure 1). The ability to adapt to these changing ocean conditions may be critical for the success of the species, and the ecosystems they inhabit. Recognizing adaptation in the face of a changing ocean is contingent on understanding vocal behavior now in a relatively quiet ocean, and comparing it to future behavior. Understanding patterns of use and the role of non-song vocal behavior in humpback whale communication allows for a more comprehensive assessment of the potential risks of increasing man-made (anthropogenic) noise. Figure 1 – Humpback whales increasingly share the ocean with vessels ranging in size from cruise ships to zodiacs. All motorized vessels have the potential to input some sort of noise into the marine environment. As acoustically oriented animals humpbacks whales produce a wide range of vocalizations to communicate, though their function is not yet understood. 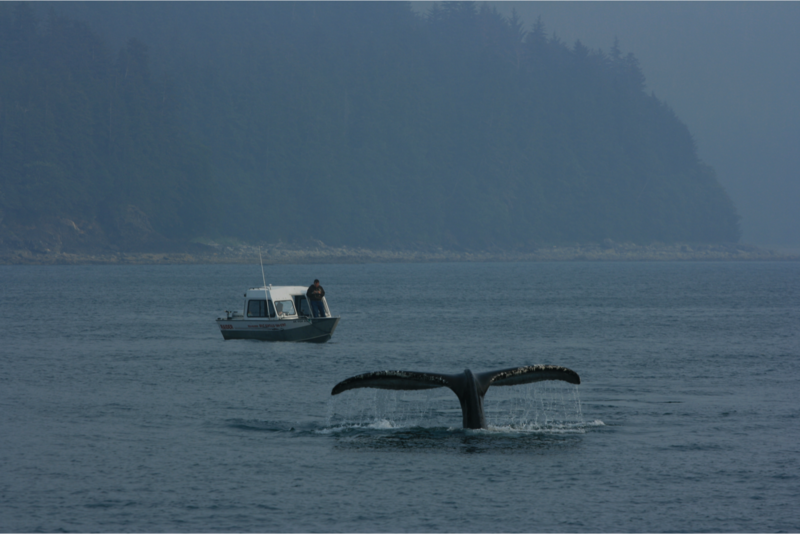 Figure 2 – A recent study of Southeast Alaskan humpback whales found that whales produce at least 16 unique call types that fall into one of four vocal classes. Example spectrograms (visual representations of sound) of calls from each class are shown above: (L-R) Low-Frequency Harmonic, Pulsed, Noisy/Complex, Tonal. Figure 3 – Humpback whales are considered a medium sized baleen whale, weighing in at approximately 35 tons in weight and reaching lengths of 30-50 feet. Payne, R.S. and S. McVay, Songs of humpback whales. Science, 1971. 173(3397): p. 585-597. Dunlop, R.A., D.H. Cato, and M.J. Noad, Non-song acoustic communication in migrating humpback whales (Megaptera novaeangliae). Marine Mammal Science, 2008. 24(3): p. 613-629. Stimpert, A.K., et al., Common humpback whale (Megaptera novaeangliae) sound types for passive acoustic monitoring. Journal of the Acoustical Society of America, 2011. 129(1): p. 476-82. 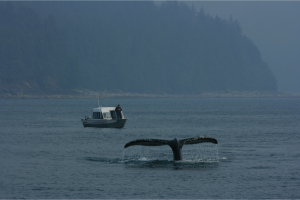 Fournet, M., Vocal repertoire of Southeast Alaska humpback whales (Megaptera novaeangliae), in Marine Resource Management2014, Oregon State University. Rekdahl, M.L., et al., Temporal stability and change in the social call repertoire of migrating humpback whales. Journal of the Acoustical Society of America, 2013. 133(3): p. 1785-1795. Dunlop, R.A., et al., The social vocalization repertoire of east Australian migrating humpback whales (Megaptera novaeangliae). Journal of the Acoustical Society of America, 2007. 122(5): p. 2893-905. Silber, G.K., The relationship of social vocalizations to surface behavior and aggression in the Hawaiian humpback whale (Megaptera novaeangliae). Canadian Journal of Zoology, 1986. 64(10): p. 2075-2080. 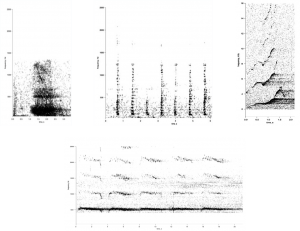 Cerchio, S. and M. Dalheim, Variations in feeding vocalizations of humpback whales (Megaptera novaeangliae) from southeast Alaska. Bioacoustics, 2001. 11/4(11 4): p. 277-295. Stimpert, A.K., et al., ‘Megapclicks’: acoustic click trains and buzzes produced during night-time foraging of humpback whales (Megaptera novaeangliae). Biology letters, 2007. 3(5): p. 467-70. 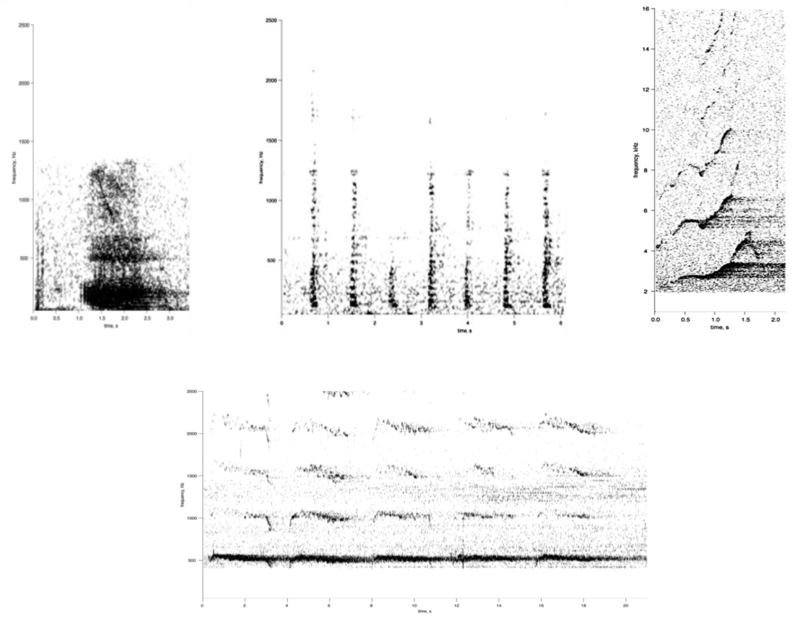 Zoidis, A.M., et al., Vocalizations produced by humpback whale (Megaptera novaeangliae) calves recorded in Hawaii. Journal of the Acoustical Society of America, 2008. 123(3): p. 1737-46.